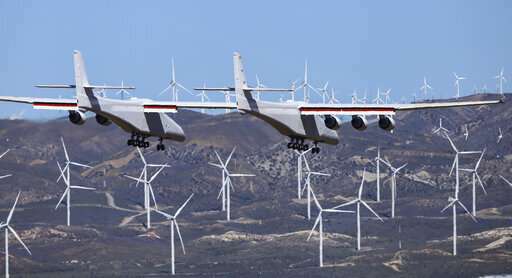 The aircraft is designed to carry as many as three satellite-laden rockets at a time under the center of its enormous wing, which stretches 385 feet (117 meters)—a longer wingspan than any other aircraft. Powered by the same type of engines used by Boeing 747s, the aircraft is designed to take off at a maximum weight of 1.3 million pounds (589,676 kilograms). 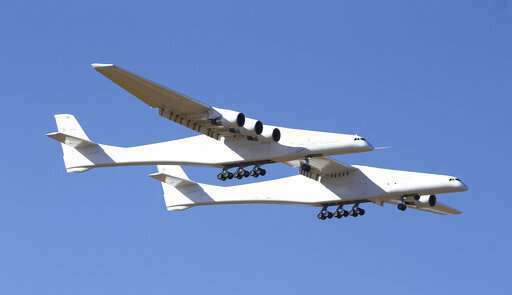 Its twin fuselages—sort of the airplane equivalent of a catamaran—are 238 feet (72.5 meters) long. The previous wingspan leader was Howard Hughes' World War II-era eight-engine H-4 Hercules flying boat—nicknamed the Spruce Goose. Surviving in an aviation museum, it has an approximately 320-foot (97.5-meter) wingspan but is just under 219 feet (67 meters) long. Great accomplishment and a credit to the hard work and dreams of Paul G. Allen. But the AGW aficionados may consider this use of fossil fuels as just another addition to 'global warming' and 'climate change'. One man's greatness is another man's source of indignation. Wondering if the aircraft is equipped with 'hybrid' engines' that transition to solar powered batteries once it is in flight and above the clouds. If not, the builders et al should consider it. It might placate the AGW crowd somewhat. It appears a pointless endeavor, due to logistics of the whole launch of the Frankenstein monster and specially designed rockets from there, to make it fractionally more efficient for first few kilometers of altitude. Reminds the shuttle dead end, and not well spent money by Allen. Yet, it was his money to spend as he saw fit, from this perspective, sure why not give it a try. Someone would sooner or later test it, so can as well cross it off the list of options to try. SEU, it seems odd that a person who apparently doesn't believe in the scientific method, as the scientific community accepts 'climate change ' as a reasonable theory, would even be interested in scientific concerns. The 'electron flow ' theory of electricity has just about the same level factual backing, care to turn your computer off?